All of us have various concerns in our lives that command our time and energy. However, there is often little if anything that one can do to affect or control these worries. This is especially true in the context of managing one’s personal finances: many investors spend far too much time and energy focusing on issues that they cannot control. In this Navigator, we apply a framework first introduced by Stephen Covey in his seminal book The 7 Habits of Highly Effective People. Covey’s framework helps to identify the concerns that are most worthy of our time and energy, as well as ways in which one can effectively address them. Applying this framework to your financial life may increase your probability of reaching your financial goals while also improving your overall quality of life. Categorizing your concerns in this way helps you focus your time and energy only on those worries over which you have some measure of control. Covey also suggested that your circle of influence can be enlarged. 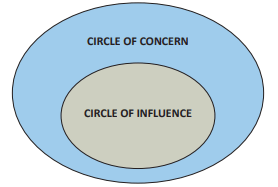 Certain concerns might initially seem to be outside of your circle of influence, but you may take steps to enlarge your circle of influence to address those concerns. As investment advisors, we strive to help you develop and eventually achieve your most important financial goals. The process of developing financial goals can be challenging because it involves imagining an uncertain future and making assumptions about a multitude of risks that could compromise that future. The best way to increase the probability of meeting your financial goals is to develop a plan, follow that plan, and take appropriate steps to address your most important risks. The risks that could compromise your financial goals can be categorized as personal (e.g., unexpected job loss), behavioral (e.g., extreme risk aversion), and circumstantial (e.g., a stock market crash). We hope that you can identify what your important personal finance risks are, and, as Stephen Covey rightly pointed out, determine how to best address them. If not, please call us so that we can help you do so. 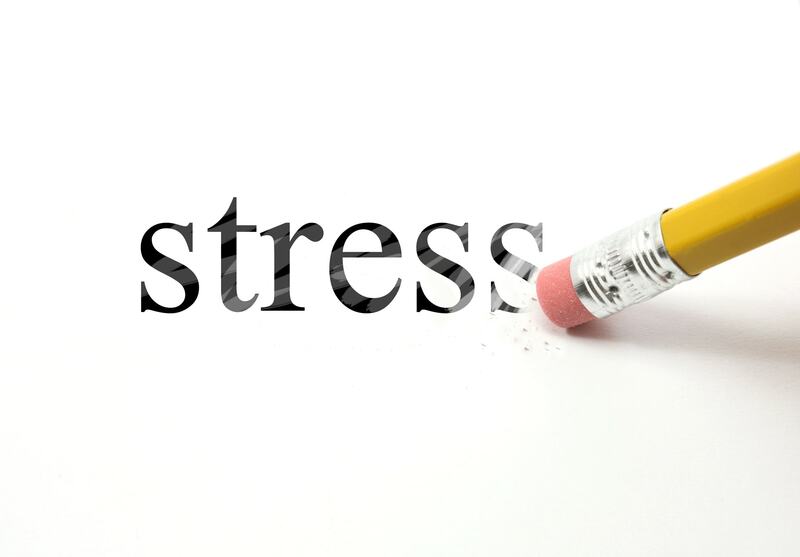 If you spend time and energy worrying about risks over which you have no control, you are probably creating undue stress. On the other hand, if you don’t work to address the concerns over which you do have control, the probability of achieving your financial goals declines considerably. 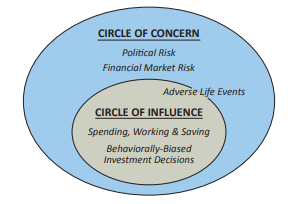 Understanding your important risks is one important step (of many) in constructing a well-thought out financial plan, but so too is distinguishing key risks within your circle of influence from key risks outside your circle of influence. We illustrated above a few of the important financial concerns that many people face in achieving their personal financial goals using Covey’s framework. The concerns you have which reside within your circle of influence are within your control. We can make you aware of some of them, and we can make strong recommendations, but ultimately, much of this work falls on your shoulders. Retirees who rely upon their investment portfolio for 30+ years to fund living expenses should seek to spend less than 3% of their investment portfolio each year.1 If you are in such a situation and are spending more than 3% for an extended period, you are increasing the probability that you will eventually run out of money. Fortunately, regardless of your employment situation, you have a powerful influence over your spending rate in retirement. This risk lies largely within your circle of influence. As a retiree, you can reduce day-to-day spending by creating a spending budget and sticking to it. After constructing a budget, you may need to make difficult choices about how many houses you own, where you live, what you spend on travel, or how often you go out to restaurants. This budgeting process may be very uncomfortable. That said, we cannot emphasize enough how important it is to begin budgeting your spending and sticking to that budget as early as possible in your retirement. If you are still working but planning for retirement, you can take steps now to reduce the eventual spending pressures you may experience as a retiree. You should try to save as much of your salary as you can each year, and you should continue working for as long as you can. The larger your portfolio is when you eventually retire, the easier it will be for you to keep your spending level within the 3% threshold. In addition, if your retirement period is shorter because you decided to work longer, you will be able to spend more freely once you eventually retire. If you expect your retirement period to be just 15 years, a 3% spending limit is likely to be overly conservative. Also, even small streams of additional income from part-time work during retirement can make a dramatic difference over a multi-decade period. Behavioral biases can have a detrimental impact on investment results (see our previous Navigator: Behavioral Finance 101); thus, it is crucial for you to be aware of behavioral biases that may impact your financial goals. Although we hold the responsibility of managing your portfolio, we modulate the risk level of your portfolio based on our understanding of your willingness to take risk. We rely on you to correctly understand and communicate your risk tolerance to us so that we can invest accordingly. For example, it is important to remember that markets are risky, which remains especially true after a 9-year bull market in stocks. One of the worst financial decisions that you could make is to sell your stocks in the middle of a market panic. Wanting to sell during a panic is a natural tendency, of course, but it is a tendency that, if acted upon, could have profoundly negative and permanent consequences for your investment portfolio and your eventual ability to achieve your financial goals. Right now, while asset prices are high, the urge to buy is the greatest. Similarly, during a bear market, while asset prices are low, the urge to sell is the greatest. The right thing to do is the opposite of what your urge tells you to do. As Warren Buffett once said, it is wise to be “Fearful when others are greedy and greedy when others are fearful.” Here, too, is an area of risk within your circle of influence. First, you should understand your portfolio allocation to stocks and try to imagine how you might react if the value of the stocks in your portfolio were to decline by 50%. Obviously, such a decline would be more easily weathered by a younger investor with a long time horizon than a retired investor who relies on his or her portfolio for living expenses. In either case, if this idea is too unimaginable to even consider, you may want to reduce your allocation to stocks. Fortunately, it is an ideal time to consider such a decision given the current bull market. If you are at all wondering about this question for yourself, please call us to discuss further. Second, when stock prices decline significantly, we urge you to resist the natural temptation to ask us to sell. Buying high and selling low is not a good formula for achieving your long-term financial goals. The concerns outside your circle of influence are numerous, and we discuss a few of the more important ones below. Some of these concerns rest on our shoulders to consider as your financial advisor. While these risks are generally outside your circle of influence, you still may be able to take certain steps to enlarge your circle of influence and reduce the level of risk that you face. ◦ Losing your well-paying job, and being unable to replace your income with a similarly well-paying job. ◦ Financially supporting another member of your family who has lost their job. ◦ Becoming unexpectedly sick or disabled or caring for a loved one who becomes unexpectedly sick or disabled, requiring both time and expense. ◦ Experiencing significant property damage due to flood, fire, or natural disaster. ◦ Falling into an expensive legal dispute or getting divorced. These situations, while unexpected and unfortunate, occur far too regularly, and they can seriously derail your ability to meet your long-term financial goals. You might be able to mitigate many of these risks with appropriate insurance policies, including life insurance, health insurance, disability insurance, homeowner’s insurance, umbrella insurance, and/ or long-term care insurance. If you are not sure whether you are properly covered with insurance, please ask us for help. We act as a fiduciary for our clients, and we have no relationship with any insurance companies nor do we sell any insurance to our clients. Therefore, we can provide an unbiased opinion on insurance decisions. With regards to a financially disastrous health event, the best thing that you can do besides buying appropriate health insurance is to take good care of yourself by eating healthily and exercising regularly. Pursuing preventative health measures is far less expensive than extended hospitalizations, and they provide health benefits which could save you money and, more importantly, increase the length and quality of your life. Finally, when you experience an adverse life event, we request that you reach out to us so that we can work together in revisiting your financial plan, your financial goals, and possibly your investment strategy. When the facts of your life change significantly, your financial plan might have to change too. Stock prices rise and fall, and so too do the prices of real estate, precious metals, and bonds. The prices that Mr. Market assigns to your various financial assets in the future are impossible to predict. With interest rates still at low levels and financial asset prices across many asset classes at near record highs, financial risk currently appears to us to be greater than average. For that reason, we are keeping bond maturities short, and we have a lower exposure to stocks than we might have if stocks were more attractively priced. In addition, we try to keep our client investment portfolios diversified across asset classes. By owning a number of different asset classes and rebalancing regularly, we help to mitigate the portfolio decline that could occur during extreme market events. As you already know well, we are not in control of the markets. For that matter, neither are you. Despite our best efforts to invest carefully and diversify, our clients regularly experience portfolio declines, and more aggressive portfolios can experience significant portfolio declines. We suggest that you talk with us regularly to truly understand your willingness to tolerate risk (see our earlier discussion on behaviorally-biased investment decisions). If you think you want to reduce risk in your portfolio, it would be better to do so now while asset prices are elevated than to wait until the middle of a deep bear market. Besides checking in with us regularly regarding your risk tolerance, we recommend that you spend your limited time and mental energy on other pursuits. The movement of financial markets is outside your circle of influence. Worrying about the snapshot value of your investment portfolio will not help it grow. While Pershing and Schwab allow you to check the value of your account on a daily or even hourly basis, such a practice is likely detrimental to your psychological and financial health. Research suggests that investors who look at the value of their portfolios more frequently are less happy and achieve lower investment returns than those who look at their portfolios less frequently.2 Even though you receive monthly statements from your custodian and quarterly statements from us, an annual checkup occurring in conjunction with an annual review should be more than enough for most people. Ironically, Stephen Covey mentioned national debt as an area of concern when he first published The 7 Habits nearly 40 years ago. At the time, the level of national debt relative to the size of the U.S. economy was less than half what it is today. Setting the risk of nuclear war aside, which Covey also mentioned, the political and geopolitical risks investors face today are currently high, in our view. Policy and geopolitics could affect the value of the dollar, your income tax rate, or the value of your home. These risks, while worrisome, are outside the Circles of Influence for most people. When we manage your investment portfolio, we make investment decisions that take political risk into account, but our influence here is also limited depending on the nature and magnitude of the potential political risk. Retirement accounts remain extremely tax efficient, and you should use these accounts to minimize the detrimental effect that higher tax rates could have on your financial plan. If you are still working, you should maximize your annual contributions to your employer’s 401(k) or 403(b) plan each year. In addition, you should maximize your annual non-deductible contributions to your Pershing or Schwab IRA account each year. You may also choose to participate in the political process to the extent that you are able and willing to do so, but aside from that, we recommend you try to focus your mental energy on those concerns that reside within your Circle of Influence. Leverage risk (having too much debt in relation to your assets or your cash flow). Liquidity problems (having too much of your net worth in illiquid assets). Excessive concentration (having too much of your net worth in a single investment). Fear of missing out (worrying that your neighbors are doing better in the stock market than you are). Longevity risk (living until the age of 110). We are not going to discuss these additional concerns in detail, but the Covey framework is useful with any concerns you might have about your own individual circumstances. First, identify the concern. Second, determine whether it is within your Circle of Influence or not. If the concern is within your Circle of Influence, take appropriate steps to address it. If it is not within your Circle of Influence, spend your limited time and energy on matters where you do have influence. If you would like to discuss any of your concerns with us to determine what, if anything, you can do to reduce your risk and improve your financial situation, please do not hesitate to reach out to us. 1 This spending rule is commonly known as the 4% retirement rule. However, given how low interest rates are today, and given the assump- tion that the Federal Reserve will be working to keep interest rates below the level of inflation, we think it is prudent today to pursue a modified and conservative 3% retirement rule.